I was planning on posting a recipe for vegan scalloped potatoes (which I will eventually when my oven gets over its hissy fit), but my oven had other plans. Not sure what to do with the huge bag of potatoes I bought, I decided to whip up a simple chowder for dinner. 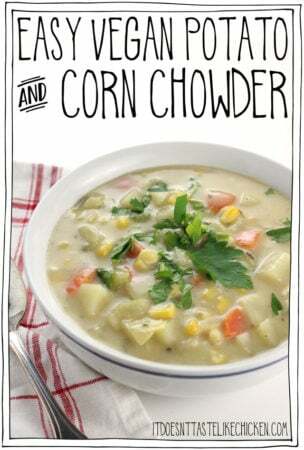 Well, it’s time that I thanked my grumpy oven, and perhaps give it a real good polish, because wow am I glad I made this Easy Vegan Potato and Corn Chowder! Simple, hearty, creamy, comforting chowder is just what the doctor ordered. (Not the oven doctor, he ordered a new ignitor). But the food doctor that is Sam’s stomach. The ingredients are so simple but isn’t simple often the best? 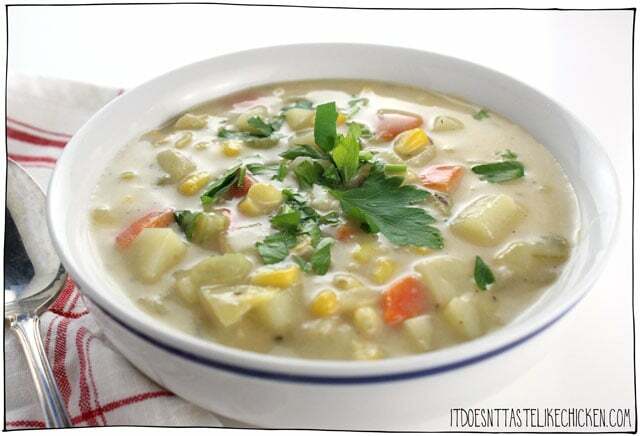 This Easy Vegan Potato and Corn Chowder would be perfect for a quick weeknight meal. It’s fantastic all on its own, but it’s also great served with a side sandwich or a crusty baguette and topped with vegan cheddar cheese or Addictive Coconut Bacon Bits (page 210 in Fuss-Free Vegan). 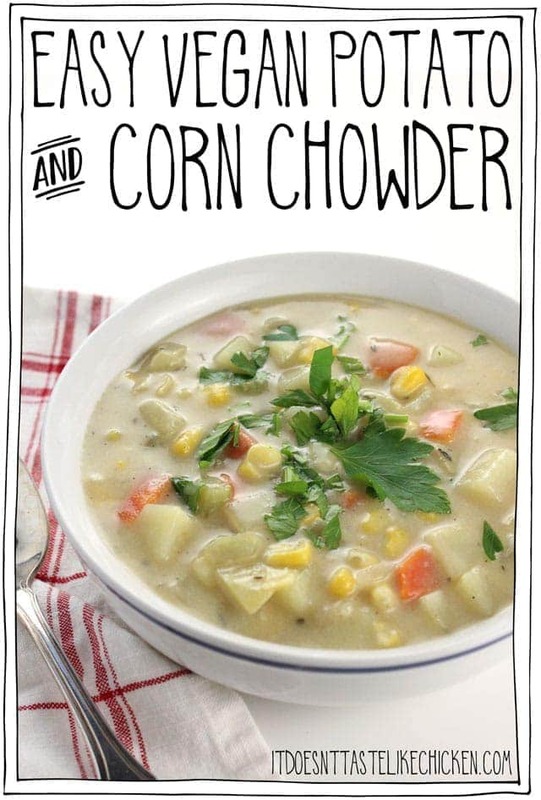 To make Easy Vegan Potato and Corn Chowder: heat the oil in a large soup pot over medium-high heat. When hot add the carrots, celery, onion and garlic. Sauté until the vegetables just start to soften and the onion turns translucent and begins to brown, about 5 minutes. Sprinkle the flour and thyme over the vegetables and stir to coat. Continue to stir and cook for about a minute until the flour starts to brown. Stir in the vegetable broth, non-dairy milk, and nutritional yeast. Bring to a simmer and cook until the potatoes are fork tender and the chowder has thickened, about 8 minutes. Lastly, add in the corn and season with salt and pepper. 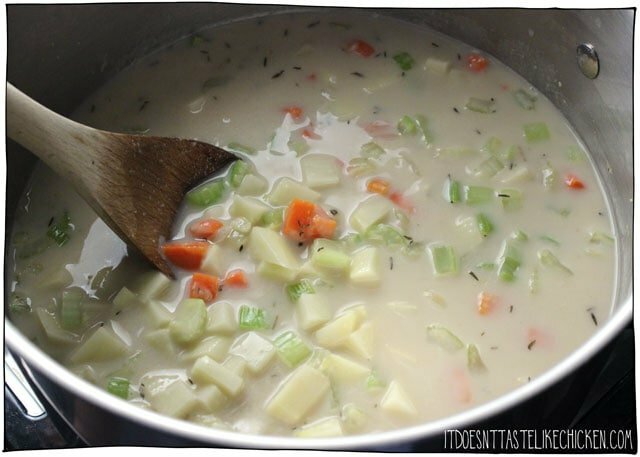 If your chowder gets too thick, you can always thin it with water or a vegetable broth to the desired consistency. Serve hot. You can top with optional garnishes such as chopped parsley, Addictive Coconut Bacon Bits (page 210 in Fuss-Free Vegan), or vegan cheddar cheese. 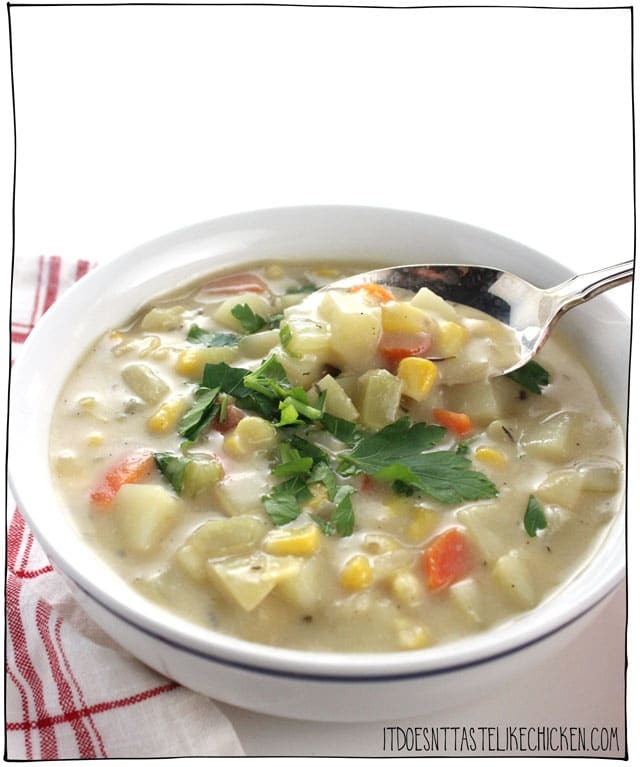 Creamy, comforting vegetable chowder, perfect for a quick weeknight meal. Heat the oil in a large soup pot over medium-high heat. 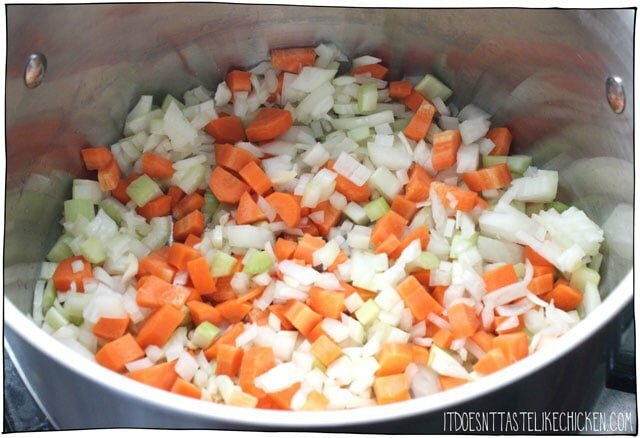 When hot add the carrots, celery, onion and garlic. Sauté until the vegetables just start to soften and the onion turns translucent and begins to brown, about 5 minutes. Sprinkle the flour and thyme over the vegetables and stir to coat. Continue to stir and cook for about a minute until the flour starts to brown. Stir in the potatoes, vegetable broth, non-dairy milk, and nutritional yeast. Bring to a simmer and cook until the potatoes are fork tender and the chowder has thickened, about 8 minutes. Lastly, add in the corn and season with salt and pepper. 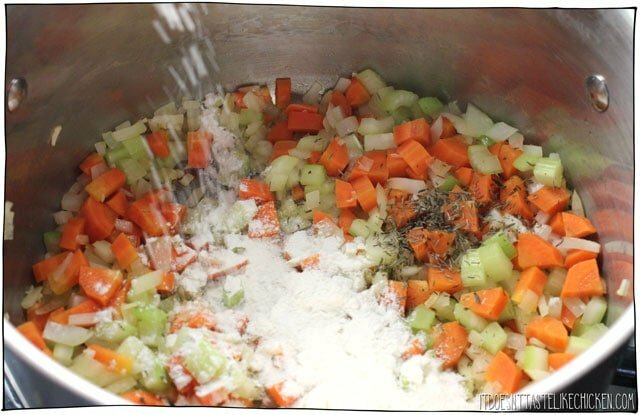 If your chowder gets too thick, you can always thin it with water or a vegetable broth to the desired consistency. Serve hot. Wish there were 6 stars to rate it. I adjusted the amounts to my taste. I used 2 cups of veg broth and 3/4 cup of almond milk. Then the nooch. Oh my. So delicious!!! What a perfect combination!!! Haha, so happy you enjoyed, Chris! I made this to be my dinner for this week at college! Very yummy. 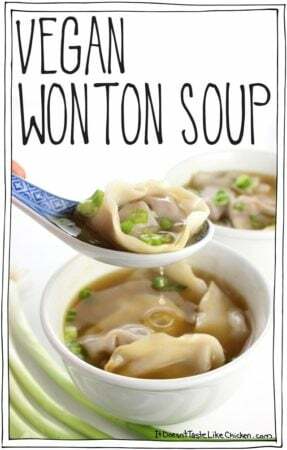 I totally look forward to coming home to a bowl of this soup! Thanks! Oh I liked this very much!!! I used Rippl 1/2 and 1/2 because I had leftovers from Holiday baking and it really made it nice and creamy! So simple, but so flavorful! I only have one question: *when* are you supposed to add the potatoes to the pot? 😉 I added the veggies, the flour and thyme and never saw where the potatoes are added. Thanks Sam! This is a winner for sure!! Ah thanks! I see it does say it now. When I originally imported it into my recipe program, there was no mention in Step 2! Thanks!!! Made this for New Years Day (today)! I added the cup of corn the recipe called for but we SUPER love corn so I pureed a cup of naturally sweet corn and added it to the soup! It was a hit! I will add this recipe to my favs! Can’t believe how good and easy this soup was. Made it the second time for company and 3 asked for the recipe! Making it for the 3rd time today. Between this, lentil and your mushrooms soup, I am trying to eat soup every day in the freezing winter here. Planning on working my way through your cook this winter. Thanks again. Hi, I’m having trouble with lumps in the chowder. Any advice? Chowder is supposed to be lumpy. Can you freeze the leftovers? I’m thinking the potatoes may get get funky. Yeah, potatoes tend to get weird when frozen, I wouldn’t recommend it. Decibel fixed my comfort food craving. I’ve made this soup twice. My husband who grew up in New Orleans and loves soup. I put Cajun essence and rustic rub in it. It was amazing. 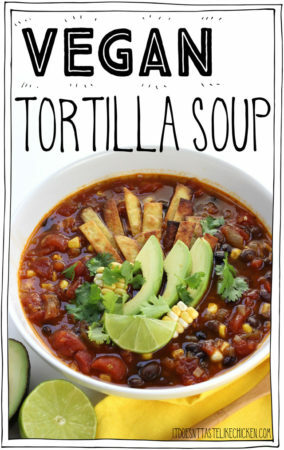 This is our go to soup. I would like to have more of your recipes. So thrilled you love it so much, Patricia! You can see my full recipe index here, and I have even more recipes in my cookbook Fuss-Free Vegan. Enjoy! A very nice recipe, which I am enjoying right now. Thank you, Sam. 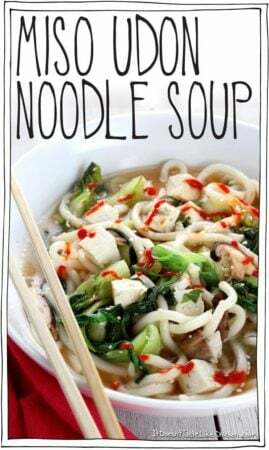 I made one change: instead of nut milk, I diluted some almond butter in a bit of broth, and added this at the very end, after turning off the heat. So good. We use rice milk as our house milk and this was great!!!! Love adding a mix of veggies into soup. However, I just leave out the yeast as i don’t have it now. So would the taste change much without the Yeast? Also when you add the corn that was frozen, do you let it defrost first? No need to defrost soup. Corn is so small that when it’s frozen and added to the soup it heats up very quickly. Enjoy! Will leaving out yeast change flavor? The nutritional yeast adds a slight cheesiness, you can skip it if you like. Enjoy! I made the chowder. It turned out delicious and was quite simple to put together. Thank you for the recipe! Instead of soy milk or almond milk, I used cashew milk which I made by just soaking about 1/2 cup of cashews and then blending with 2 cups of water. I just made this for my sister, who’s fighting a nasty flu, or something. I’m hoping it helps her feel better. I was really lucky that I had all the ingredients, too! Glad you enjoyed, hope your sister feels better! Sam- Amazing!!!! 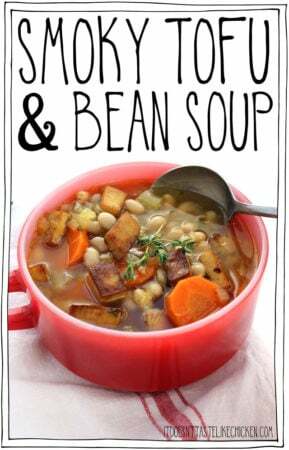 It is FrEEZing here and this was the perfect soup on a day like today. Also, I’m cooking through your cookbook and have loved the recipes so far!!! So easy and delish for weeknight dinners. Thanks! I just made this and it’s fantastic! I had some potatoes that were getting old and this worked out perfect. Thanks! The perfect solution for someone on gut wrenching antibiotics! And any other time, as well. Thanks for the comfort food Sam. 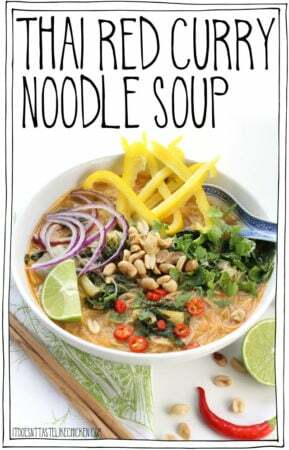 Amazing soup, perfect for a winters day. 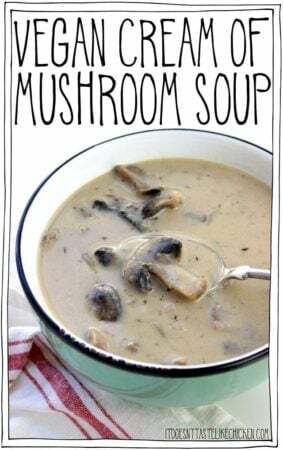 I discovered one day when I was trying to make a creamy soup that adding a tablespoon of tofu crème cheese really makes a dish creamy and tasty. I use it for any number of dishes, even Indian and thai dishes that are made with creamy sauces. You can always add more to your taste. Usually I add it to some liquid before putting it into the dish but not always as in some dishes it dissolves in the pan and only needs mixing in. If you really want it thinned with no lumps you can put the tofu crème cheese and some of the liquid fro the dish into a small blender. Woohoo!! Can’t get a better review than that! Thanks, Mary! We are trying to get more vegan food dishes on the family menu. Every family member loves potatoes and corn, so this is certain to be a hit with everyone! Wow. This is positively decadent!! I love it! We are in the midst of a freeze where I live so this was just perfect!!!! Thrilled you loved it, Joanne! It’s very frozen and snowy here in Toronto too right now! Hi Sam, just made your chowder and it’s quick, easy and tastes great! I added some soya chunks for extra protein and am feasted on two and a half mugs of this smooth and satisfying chowder. Maybe a silly question but…. do you add the potatoes at the same time as the broth, milk and nooch? Made your recipe this morning & really liked it. I omitted the oil & used broth for the sauté & substituted brown rice flour in place of the all-purpose. I will be making this again. Thanks Sam!